It's that time of year again: sickness is taking over. I have had a sinus infection for close to a week (on top of being 12 weeks pregnant) and on top of that, on Friday, Tristan was diagnosed with croup. The croup was caught on day 1, so by day 2 we had moved on to a full sinus drainage/cough cold. 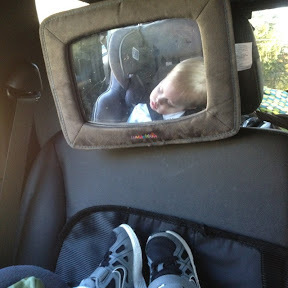 Yep, I'm sitting in the car while he sleeps. I need a break and I'm willing to sit here for a bit to get it. The steroids are making him sleep VERY lightly and everytime I try to move him he starts screaming. I'll take it where I can get it at this point. Been there done that a hundred times...a Mom has to do what a Mom has to do to stay sane!